Ink-a-Doodle Creations: All Things Fall September SSINK Blog Hop!!! All Things Fall September SSINK Blog Hop!!! Good morning and thanks for visiting me at Ink a Doodle Creations. 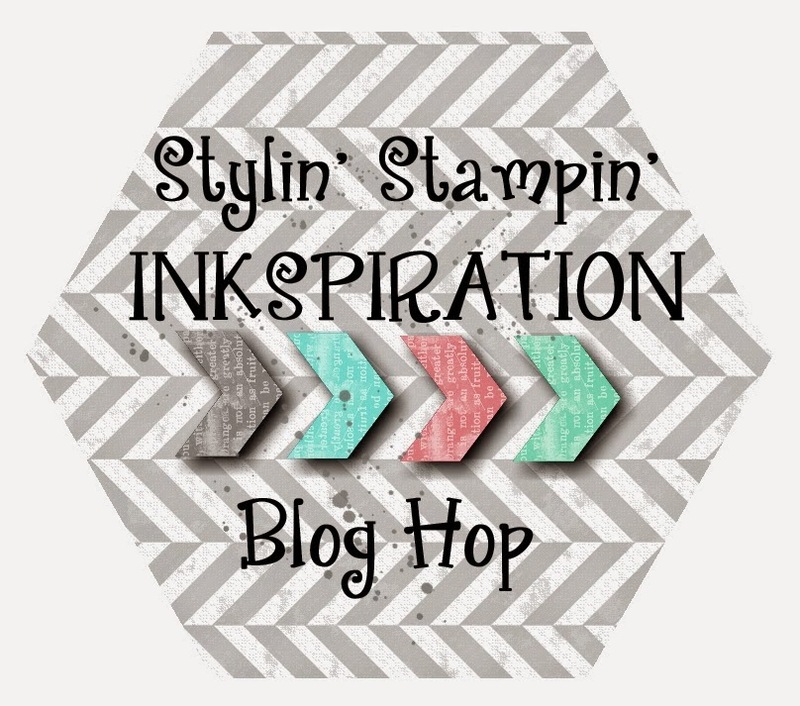 Today is Blog Hop day over at Stylin' Stampin' INKspiration and we are sharing all things Fall. Fall is one of my favorite times of year. I really feel bad for those who live in an area that don't get to enjoy this wonderful time of year. I love it when the air starts to turn cooler, the leaves are starting to turn to their beautiful fall colors and it also starts to put me in the mood for Halloween, hot apple cider and hot cocoa while setting by an outside campfire roasting marshmallows..... Ok, enough about yummy treats and on to the hop!!! As you hop along, please be sure to comment and show some love on every blog! We are always excited to hear from our followers! You should have just left stop number #10, Kim at Stamping with Kim on the Stylin' Stampin' INKspiration Blog Hop. If so, you are in the right spot. If a link doesn't work or you get off track, you will find the full blog hop lineup below. Last week I posted a scrapbook page that was for our color challenge, click HERE to go see it, and I promised that I would be creating a second page to go with it. The colors are kept the same thru out this page too. Sahara sand for the page, rich razzleberry for the large background, early expresso for the film strip and crushed curry and calypso coral for the leaves. I also used the same natural twine and gold buttons to accent the leaf clusters. This background has also been stamped with an inked up chevron embossing folder and the acorns from the "For All Things" stamp set. On this page you have room for a 4x6 picture and two smaller wallet sized photos in the film strip. On this page, I did a little something different. Instead of stamping the leaves from the stamp set and fussy cutting them out, I cut out the leaves using the autumn accents big shot die and then using the square-ish background stamp from the set, I stamped each leaf several times with each color. They were quick and easy too!! I couldn't just stop at a scrapbook page, I had to create a fun card to go along with it. I kept the layers simple, starting with a base of rich razzleberry. I next cut a layer of whisper white and shredded the edges and stamping random leaves in matching colors and added the detailed leaf stamp in rich razzleberry on top. I finished it off with a bow tied in natural twine and attached on top of a gold button. I'm so loving these gold buttons. Now that you've seen my hop projects, leave some "love" and hop on over to stop #2, Diana at Stampin' Fun with Diana. What a fun card and layout! I love that "bump out" section on the card. Beautiful projects! Thanks for the how to on the leaves...I will have to try that! Love the scrap page...I envy you and your love for traditional scrapping! Very pretty card too! Thanks for show casing this stamp set, it's awesome. And, so are your card and scrapbook page. TFS! I love your take with that stamp set. I only make cards and will have to copy yours. It's lovely. First time visitor to your blog. Thanks for sharing. Great page, I love all the details. Thinking it would be fun to CASE into a card, may have to give it a try. TFS! !